Based on favorable reports from the scouts sent to America in 1874, and through the personal experiences and encouragement of Rev. Stärkel and others, a small party of seven families and two single men were the first Volga Germans and the first people from Norka to immigrate to the United States in 1875. They likely traveled by train from Saratov to one of the Northern European ports. Worries and doubts about being successful in America were on their minds. The emigrants also worried if their sea-traveling papers were in order, and if the ship’s surgeon might reject them for health reasons. This group sailed from Liverpool aboard the steamship City of Brussels which made a stop in Queenstown, Ireland before arriving in New York harbor on June 28, 1875. At least five of the seven Volga German families onboard this ship were from Norka. Steamship "City of Brussels" from the Tod & Macgregor Shiplist website. The first Volga German family listed on the passenger manifest is Heinrich and Elisabeth Schreiber. Heinrich is the son of Johannes Schreiber (born 1800) and Catharina Elisabeth Kern (born 1803). The next family listed is Johannes and Anna Maria Müller (anglicized to Miller). Johannes is the son of Heinrich Müller (born 1806) and Katharina Margaretha Seder (born 1814). Anna Maria is the daughter of Ludwig Schnell (born 1812) and Catharina Jörg (born 1813). The third family listed is Johann Heinrich and Elisabeth Trüber. Johann Heinrich is the son of Heinrich Trüber (born 1810) and Catharina Hessler (born 1807). Johann Heinrich first married Maria Barbara Maul who died in September 1871. Johann Heinrich then married Elisabeth Preisendorf. The fourth Norka family listed is that of Johannes Jörg (anglicized to George) the son of Peter Jörg (born 1786) and Anna Margaretha Müller (born 1786). Johannes married Catharina Reuscher (born 1817) who died before the family immigrated to the United States. The fifth family listed is Johannes and Margaretha Jörg. Johannes was born on December 8, 1842 and is the son of Johannes Jörg listed in family three (born in 1817) and the brother of Friedrich Jörg. Margaretha is the daughter of Johannes Fuchs (born 1817) and Anna Elisabeth Blum (born 1819). This group of families initially settled in Bluffton and Sandusky, Ohio and worked for two years at ditch digging and other similar tasks among the farmers of the community. During this two-year period they were on the lookout for land which they later found near Sutton, Nebraska. The Johannes Jörg, Friedrich Jörg and Johann Heinrich Trüber families were first to move to Sutton. Part of the Nebraska group would later migrate to Oregon. According to Dr. Ruth Schultz, Johann Georg and Elisabeth Schreiber were the parents of the first child (Helena) of Volga German descent to be born in America. Elisabeth must have been pregnant on the journey as Helena was born in September 1875. Dr. Schultz also reports that during the 1874-75 biennium, 89 people emigrated from Norka to the Americas. This was a very small percentage of the Norka population at that time. "Eight-five families, mostly from the colony of Norka, but included some from Balzer, gathered at Saratov and journeyed to Bremen from which they sailed for the United States landing at New York, July 7, 1876... Some of them were persuaded to go to Milwaukee, Wisconsin, on the grounds that there were many Germans there, but they did not stay long, coming to Sutton the following spring. Another group of thirty families was taken to Kansas free of charge by the Santa Fe Railroad, and while waiting at Atchison, one carload was stolen by the Burlington and Missouri immigration agent and sent to Sutton, Nebraska. The remainder was taken to the immigration house at Pawnee Rock in Barton County, Kansas. They got in touch with the Burlington and Missouri land agent in Lincoln where they purchased land along the Turkey Creek not far away from Friend. Another group was brought to Red Oak, Iowa and many of these settled in Harvard, Nebraska. But before long, Lincoln became the center of Protestant Volga Germans because of its greater opportunities for employment. From this city many people moved on to new homes in Portland, Oregon, Denver, Colorado and other points in the west." 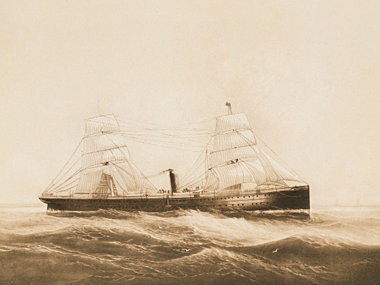 Image of the steamship "Oder" from the Hapag-Lloyd website. On December 8, 1876, 53 people from Norka arrived in New York on the steamship Frisia which had sailed from Hamburg, Germany and Le Havre, France. The families and individuals on this ship included the Krieger's (14 people), Scheidemann (6 people), Spady (1 person), Bartel (1 person), Schwindt (2 people) Wolf (1 person), Seder (3 people), Schreiner (3 people), Döring (1 person), Schnell (2 people), Repp (6 people), Traudt (5 people), Hefeneider (2 people) and Schreiber (6 people). Immigration to the United States increased during the late 1800's as a result of the severe famine from 1891-1892. The outflow of emigrants from Norka continued until the early 1900's when World War I and the Bolshevik Revolution stemmed the flow. Migration in smaller numbers continued until the early 1920's when leaving the Soviet Union was all but impossible. First hand descriptions of the journey from Norka to America are rare. We are fortunate to have a letter written by Carl Krieger about his travels in 1890 which vividly describes his experience. Haynes, Emma Schwabenland. "Passenger Lists." Journal of the American Historical Society of Germans from Russia Vol. 2 No. 1 (1979): 68-71. Print. Karlin, Athanasius. "The Coming of the First Volga German Catholics to America." Journal of the American Historical Society of Germans from Russia (Winter 1978): 61-65. Print.